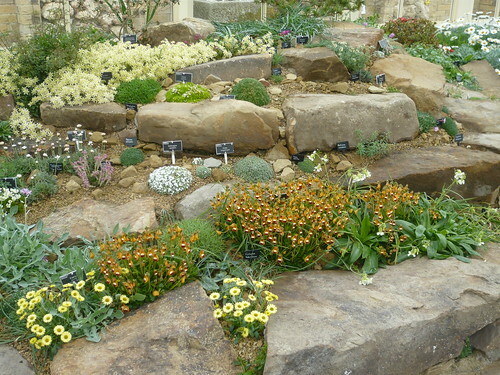 Harlow Carr the formern Northern Horticulture HQ and now owned and managed by the RHS has a varied display of Alpine plants in the well designed alpine house shown above. Within 10 miles of Harrogate there are several stunning gardens and historic houses to visit. Newby Hall and Ripley Castle are covered in some detail on the Yorkshire Gardens page of Gardenerstips alongside some valuable comments about the Royal Horticultural Gardens at Harlow Carr above. What is unaccountably missing is any reference to Harewood House . Since the mid 18th century the gardens around the great house have been enhanced by a series of garden designers starting with Capability Brown. The Walled Garden was built in stages from 1755-1780 followed by the Rock garden created to prevent a lake flooding. The Woodland Walk the Parterre and the Archery border provide enough interest to fill the best part of a day and there is still the house to visit. Make a point of visiting these great Yorkshire gardens and houses this summer starting at Newby Hall in Spring, Harewood in summer and the the others to suit. All of them make a good half day or full day trip or you could arrange to visit all four during a planned holiday.